Spain is a sovereign nation in southeastern Europe. It borders France, Andorra, and Portugal. The Balearic Islands in the Mediterranean Sea belong to Spain. Spain also has territories outside of Europe: the Canary Islands and two cities in Africa, Ceuta and Melilla. 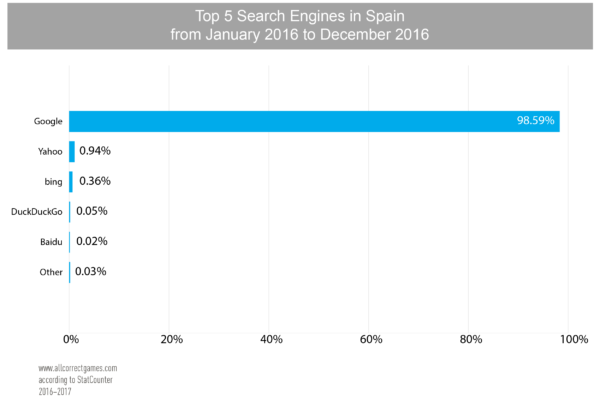 Spain is the most popular tourist destination in Europe. Its primary tourist centers are Madrid and Barcelona, as well as the resorts of Costa Brava, Costa Daurada, Costa Blanca, Costa del Sol, and the Canary Islands. Spain has the fifth largest economy in the European Union in terms of GDP and the twelfth largest in the world. 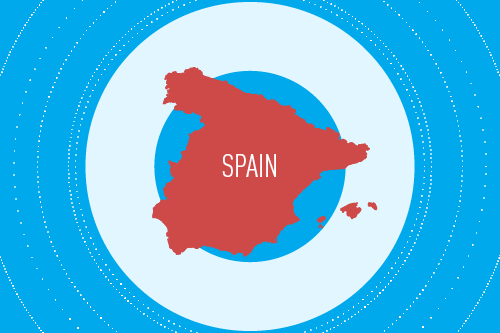 Spain is an industrial country and one of the largest manufacturing centers in Western Europe. The National Statistics Institute (INE) has published data indicating that Spain’s GDP grew by 3.2% in 2016. According to the Spanish government’s forecasts, this indicator should have been 3.3% (a 0.1% increase), and in 2017 it should be at least 3.1%, which ought to have a positive effect on the budget deficit. Experts from the International Monetary Fund have predicted that Spain’s GDP will only grow by 2.6% in 2017. 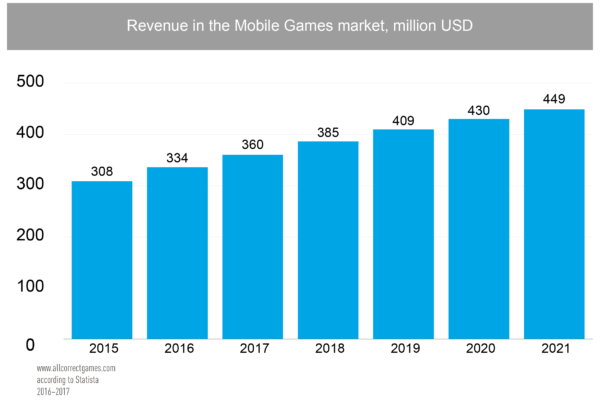 The revenue from mobile games in 2016 was over USD 334 million. It is expected to increase by 5.7% each year, reaching USD 449 million by 2021. 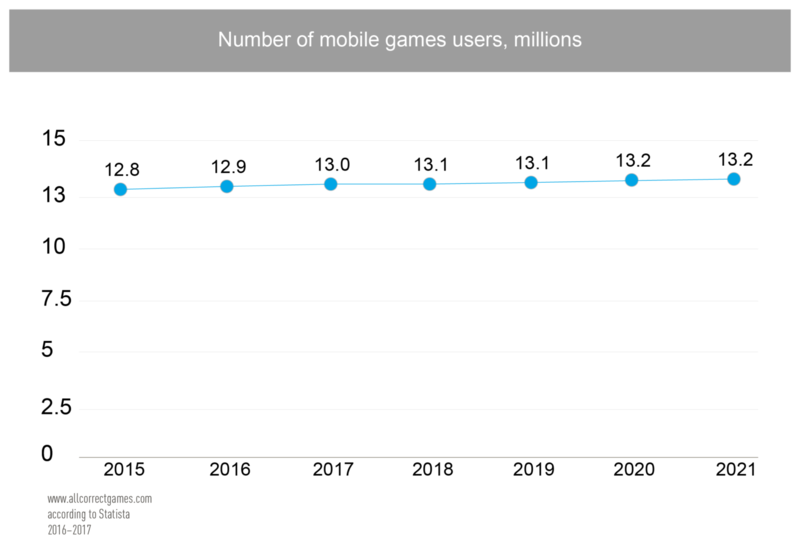 The ratio of mobile users to residents in 2016 was 32.9%. 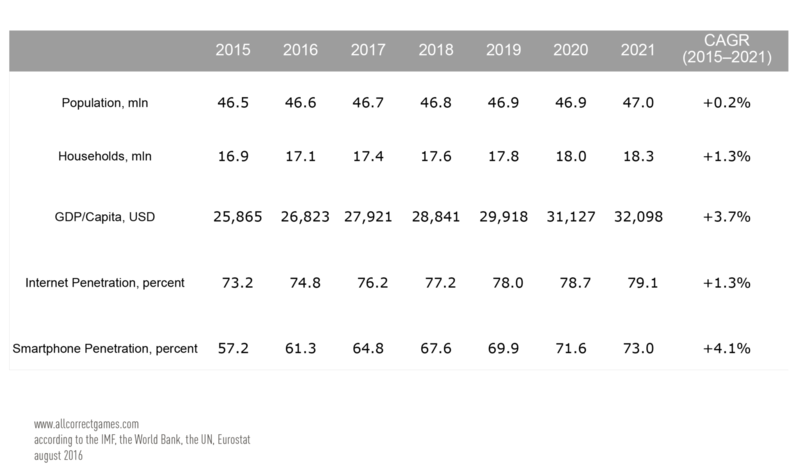 This number should reach 33.1% by 2019 and remain stable until 2021. 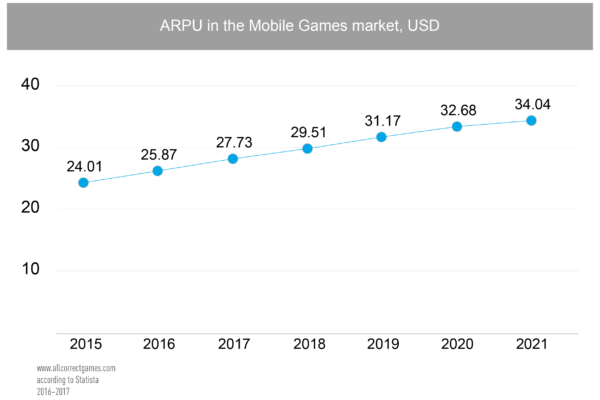 Average revenue per user (ARPU) is USD 25.87. The average cost per installation (CPI) is USD 1.46 for iOS and USD 0.90 for Android. 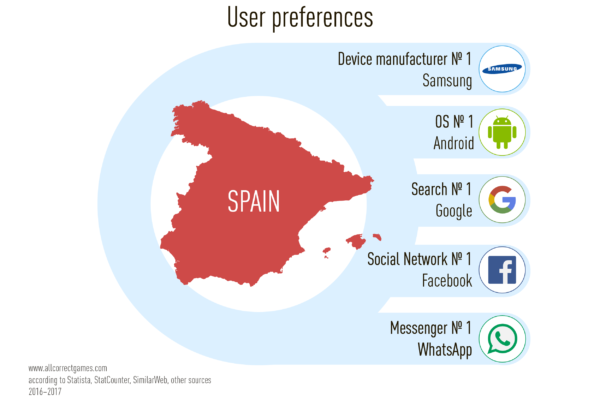 Among mobile platforms in Spain Android, Facebook, and Google are dominant. Among messengers (according to data from App Annie) the leader is WhatsApp. 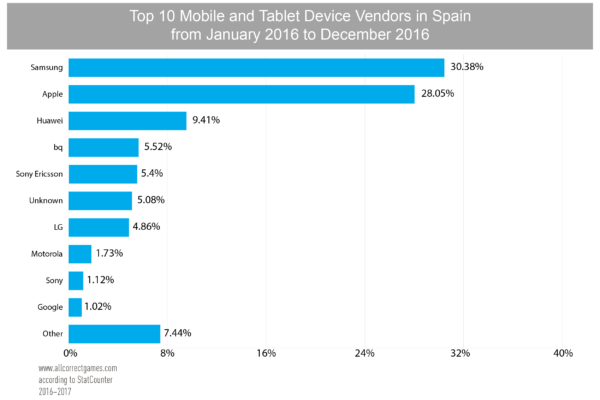 The most popular device manufacturers are Samsung (30.38%) and Apple (28.05%). 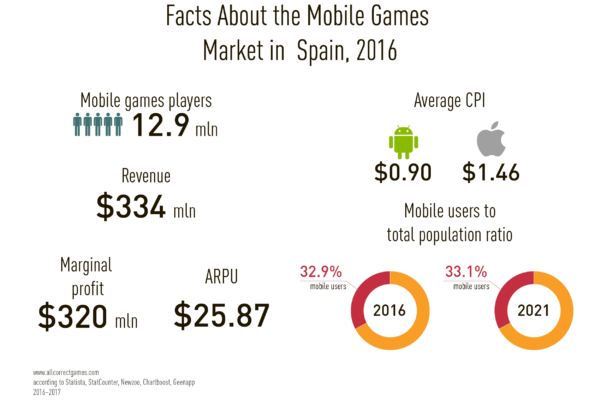 According to App Annie, arcade, puzzle, and strategy games are popular among Spanish gamers. The most-downloaded games in November 2016 were Clash Royale, Tigerball, and Block! Hex Puzzle, while the revenue leaders were Clash Royale, Candy Crush Saga, and Clash of Clans. 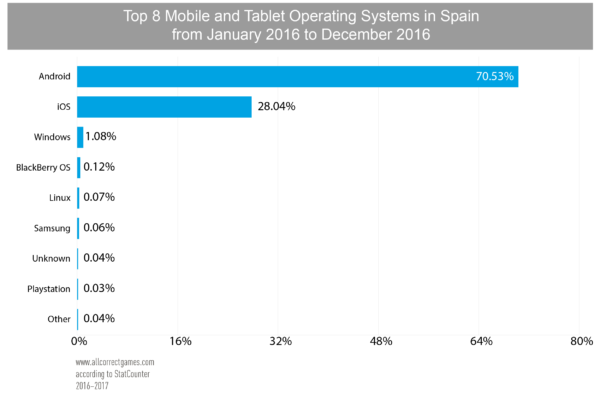 According to data from Newzoo for 2017, there are 24.1 million gamers in Spain, of which 13 million (according to data from Statista for 2016) are mobile gamers (53% male, 47% female). 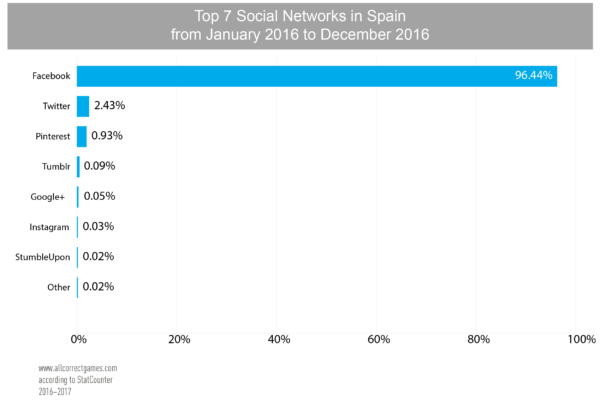 One of the largest mobile game developers in Spain is Social Point, which specializes in action, social, and strategy games. Their mega-hits are Dragon City, Monster Legends, World Chef, and Dragon Land. 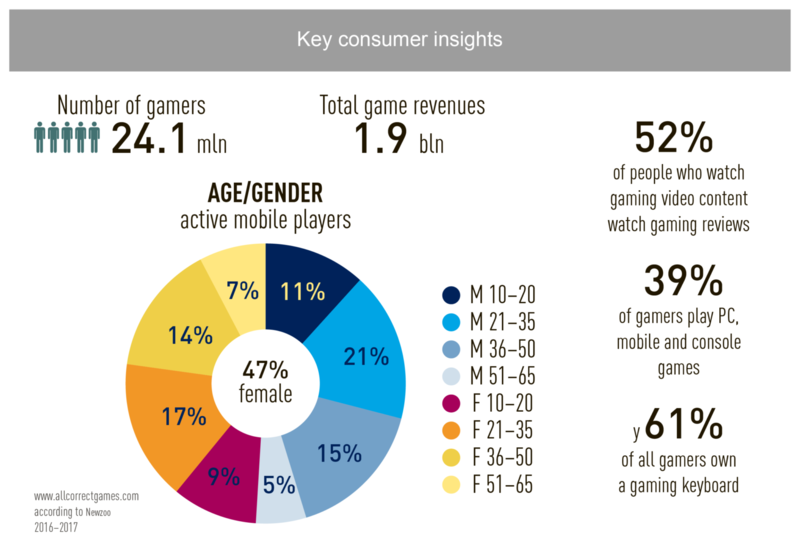 The company’s active fan base numbers 50 million gamers. In 2017 Social Point became a subsidiary of Take-Two Interactive Software, Inc.
A local company called HeYou, which has made it into the list of most downloaded apps (according to App Annie), makes arcade games. The Spanish or Castilian language is an Ibero-Romance language that developed in the medieval kingdom of Castile, which included the modern area of the Burgos province and the autonomous regions of La Rioja and Cantabria. It spread widely throughout other regions of the world (primarily South and Central America) during the Age of Discovery. Spanish is an Indo-European language (Romance group, Ibero-Romance sub-group). It is written using the Latin alphabet. With 470 native speakers it is the third most widespread native language in the world (after Chinese and Hindi) and the most widespread Romance language. According to various evaluations, up to 548 million people can make themselves understood in Spanish, including those for whom it is a second language and those who learn it as a foreign language (20 million people). The most populous Spanish-speaking country is Mexico (over 120 million residents), and the country with the largest area is Argentina. 9/10 of native Spanish speakers currently live in the Southern Hemisphere. In both Spain and Latin America Spanish is also called “Castilian” after the region in which it developed. This term is used to keep it distinct from Spain’s other languages. This division is quite popular among the populations of countries of the Southern Cone and speakers of Catalan, Galician, Basque, and other languages spoken in Spain. Many linguists believe that the term “Castilian” should only refer to the language that was spoken in Castile in the Middle Ages. However, others do not agree with them and suggest that the term “Spanish language” should not be used at all because it implies that Spanish is Spain’s only language and that Catalan, Galician, Basque, Aranese, Aragonese, and Asturian are not Spanish languages. Spaniards typically call their language “Spanish” when it is mentioned among other foreign languages and “Castilian” when it is mentioned among other Spanish languages. Both terms are used in the rest of the Spanish-speaking world. “Spanish” is more common in Colombia, Panama, Nicaragua, El Salvador, Cost Rica, Guatemala, Honduras, Mexico, the US, the Dominican Republic, and Venezuela (primarily in North and Central America), and “Castilian” is more common in Cuba, Ecuador, Peru, Bolivia, Paraguay, Chili, Argentina, and Uruguay. Translating written texts from Spanish allows the translator freer use of a dictionary, whereas this is not possible when interpreting spoken Spanish, and more extensive knowledge is also required. When working in a specialized field it is necessary to study terminology more closely. Fortunately, given that Spanish-English translation is quite widespread, finding the appropriate literature does not present a problem. A significant feature of Spanish is its large lexicon of words borrowed from Greek and Latin or based on such words. Loan words are widespread in oratory and journalism. The reason for this lies in the stylistic peculiarities of Spanish—it features extensive use of references to history, meaningful events from antiquity or the Middle Ages, and comparisons to literary narratives. A good translator should have extensive knowledge of a large number of disciplines. Familiarity with the Larousse dictionary, which includes Latin loan words, is worthwhile. Certain English and Spanish words are written similarly but have different meanings. A good example would be the Spanish word “titulo.” This word is frequently used to mean “right,” “quality,” or “achievement,” i.e. it refers to the positive consequences of possessing a title, but not the title itself. Spanish morphology is remarkable for its simplicity, which makes translating it significantly easier. The greatest challenge comes from syntax—it is necessary to know all constructions, including archaic ones. An error frequently made by inexperienced translators involves applying negation primarily to verbs (or, to be exact, to the entire sentence). Failing to recognize this syntactic feature can cause the entire sentence to lose its meaning.